ww2dbasePercy Cleghorn Stanley Hobart was born in Naini Tal, India to British Indian Civil Service employee Robert T. Hobart and Janetta Stanley. He was educated at the Temple Grove School and Clifton College in Bistol, England, United Kingdom. In 1904, he graduated from the Royal Military Academy at Woolwich in England, upon which he received a commission into the British Army Corps of Royal Engineers. He served in India, France, and Iraq until the end of WW1. He received the Military Cross and the Distinguished Service Order medals for his service in WW1. ww2dbaseIn the early 1920s, Hobart requested for transfer to the Royal Tank Corps after studying B. H. Liddell Hart's papers on armored warfare. In 1927, his sister, Elizabeth, married the future Field Marshal Bernard Montgomery. In Nov 1928, he married Dorothea Field, daughter of Royal Marine Colonel C. Field; they would have one daughter. 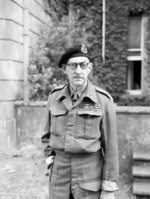 In 1934, he became brigadier of the first permanent armored brigade in the British military, while holding the position of the Inspector of the Royal Tank Corps. In 1937, he was made Deputy Director of Staff Duties in charge of armored vehicles, and later in the year Director of Military Training with the rank of major general. In 1938, he was assigned to Egypt to form and train the Mobile Force, which later became the 7th Armored Division with the nick name "Desert Rats". In 1939, he was made Companion of the Order of the Bath. ww2dbaseDespite being one of the pioneers in armored warfare, Hobart was not accepted by the more conservative cavalry generals who preferred horses to tanks. In 1940, he was pressed into retirement by influential generals such as Sir Archibald Wavell. He joined the local Defense Volunteers unit at the village of Chipping Campden as a lance corporal, and he was soon promoted to the position of Deputy Area Organizer. ww2dbaseIn 1941, upon Hart criticized Hobart's forced retirement in a newspaper article, and as a result, Winston Churchill ordered the British Army to invite Hobart back into service. Hobart was assigned to train the 11th Armored Division until the unit was sent to Tunisia in Sep 1942. Despite his declining health, he remained in service to train the newly formed 79th Armored Division. In 1943, he was made Knight Commander of the Order of the British Empire. In Mar 1943, due to lack of funding, the 79th Armored Division was on the verge of being disbanded, but a clever reorganization by Field Marshal Sir Alan Brooke kept the unit operational as the 79th (Experimental) Armored Division Royal Engineers. With this new unit designation, Hobart was charged with designing and assembling modified tanks to serve special purposes. Collectively called "Hobart's Funnies", these unconventional tanks were designed with the Normandy invasion in mind in light of the Dieppe disaster. Some of the "Hobart's Funnies" tanks include the flame-throwing Crocodile tanks based on Churchill tanks, AVRE combat engineer tanks based on Churchill tanks, Sherman and Valentine duplex driving amphibious tanks, Centaur armored bulldozer based on the Cromwell tank, and others. These modified tanks were credited with helping Allied troops land on the heavily defended Normandy beaches. When the 79th (Experimental) Armored Division Royal Engineers was disbanded on 20 Aug 1945, the unit numbered almost 7,000 vehicles attached to various Allied units across Europe. ww2dbaseAfter the war, Some of the "Hobart's Funnies" tanks remained in use until the 1990s, with some Centaur bulldozers seeing action in the Korean War and AVRE tanks fighting in the Gulf War of 1991.
ww2dbaseIn 1945, Hobart received the American medal Legion of Merit. He retired from the British Army in 1946 and passed away in Farnham, Surrey, England in 1957. 14 Jun 1885 Percy Hobart was born. 19 Feb 1957 Percy Hobart passed away. the site was kind of informative. In 1945 at Brandeston Hall in Suffolk I was a batman to senior officers, so I had the privilege of taking a morning cup of tea to Sir Percy Holbart in his last week of his retirement as I was also senior batman to his successor Brig A.W.Brown of then SADE.